Hahn Auction Building, 401 S. Oakland Avenue Nappanee, IN 46550 East of downtown Nappanee, IN on US 6 (Market St.) to Oakland Ave., then 2 blocks south. 1969 Oldsmobile Cutlass Supreme convertible automobile, overhauled 350 Rocket engine, 5-speed transmission, new carpet, vinyl, over $3,000 in NOS chrome & items in orig. 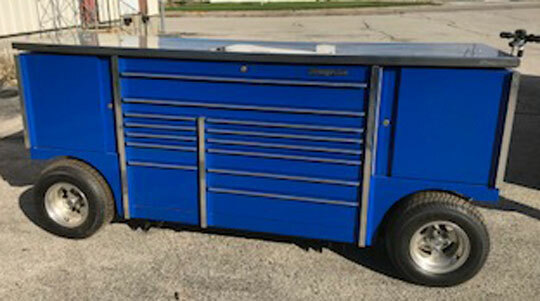 boxes - gas tank, rotors, a complete disassembled car except for top; Snap-On pit box tool wagon (blue color) model KRLR1022 stainless top, professional race auto mechanic; Numerous Snap-On, Mac, Cornwell, Blue point & other tools; Porta-Ferguson commercial Jaws of Life type Porta Power w/chains; Complete set of 1973 to 2015 all auto mfgrs. 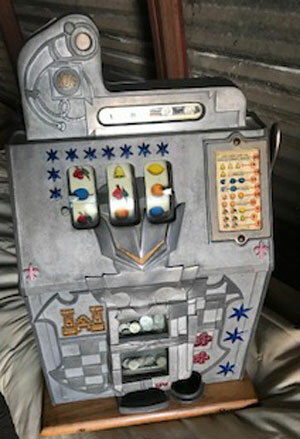 trim books; 2 welding blankets; Anco wiper; Nice Mills 1930's Knight Crest & Castle Front 10 cent slot machine w/key, works; Nice Tokheim 1940's original standard Red Crown globe gas pump w/orig. insides; Large amount of Petroliana collectibles such as old Shell water can, early 10 gal. restored gas can; 1940's Chevrolet new car silk banner; 1970's Kendall 6' NOS tin display sign; vintage fire reels, hoses, extinguishers, firebox & signs; 1970's coin-operated machine NOS w/keys; large amount restored vintage oilers; automotive sets of glassware & RC Cola NOS dealer sign; 20+ tubs of gas/oil cans, quarts tins, 2 gal. cans; beer/ liquor lighted signs; soda advertising large amount gas & oil; bus meter; large amount 45 records; Studebaker dealer display w/cans, Stude & Pack; tubs gas caps; 2 boxes nitro cans; 1970's Astro Boy orig. comic book posters, artists proof & 1st edition comic books; 10 x 20' tent w/sides, used 5 times; 10 x 10 tent w/sides; hand saw carved 5' standing bear; unusual 5' cigar store Indian done in approx. 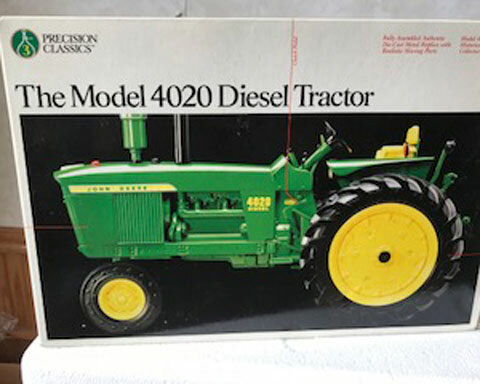 2000 by Blosser; over 400 primarily 1/16 scale toy tractors, most in boxes; Many Precision J.D. 4840, 4020, 720, Oliver 77 and Ford Jubilee, Case 930 & more; set of J.D. 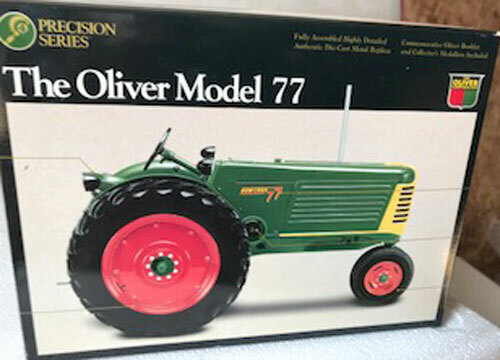 patio lawn tractors; set of Freedom, 4-wheel drive tractors - Oliver/White Spirit of 76, many Ertl - spec. cast - toy farmer; varied accompanying farm equip. plows, disc, planters, drills, hay & forage equip. and more. There are approx. (20) 3' x 3' x 3' boxes full, not researched. Come take a look. We will be running 2 rings. There is a ton of stuff here.